We come up with new instant kit "Milk Adulteration Test Kit of Biosyl" to check 5 parameters instantly. Since production of milk doesn’t meet with the current demand, adulteration is the most sorted out solution to overcome this problem. The Kit provides the right to the Milk Unions/consumer to check the quality of milk consumed instantly, anywhere, any time without the hassle of sending the sample to a laboratory. Thus, aiming to provide an assurance to the consumer on the quality of milk. Milk Adulteration Testing kit is a simple qualitative analysis kit used to detect the adulterant/contaminants in the milk. The following are the adulterants that can be detected from our testing kit -Urea, Preservative, Starch, Sugar and Detergent. The kit consists of 5 tubes with reagents and a set of instructions. This kit is a confirmatory test kit and can be used only once. 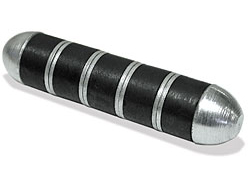 Introduced Cow Magnets - Used to protect the animal hardware diesease. Cow magnets are popular with dairy farmers and veterinarians to help prevent Hardware Disease in cattle. While grazing, cows eat everything from grass and dirt to nails, staples and bits of bailing wire (referred to as tramp iron). Tramp iron tends to lodge in the honeycombed walls of the reticulum, threatening the surrounding vital organs and causing irritation and inflammation, known as Hardware Disease. The cow loses her appetite and decreases milk output (dairy cows), or her ability to gain weight (feeder stock). Cow magnets help prevent this disease by attracting stray metal from the folds and crevices of the rumen and reticulum. One magnet works for the life of the cow.